On February 20, AOP had the exclusive honor of providing a selection of its works as the musical entertainment for OPERA America‘s annual National Opera Trustee Recognition Awards Dinner. 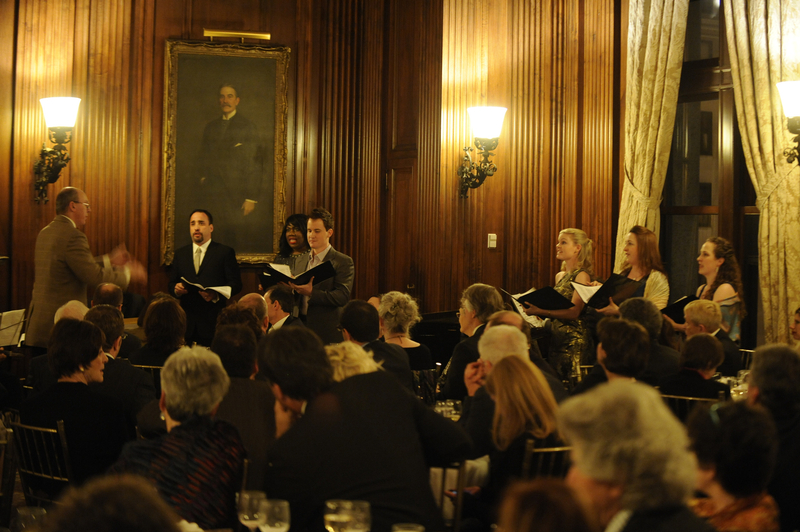 The notables from the opera world were regaled by a performance of Songs from the F Train and excerpts from Kamran Ince’s opera-in-progress Judgment of Midas. The event was held at the University Club in Midtown Manhattan. Mezzo-soprano Nicole Mitchell sang Gilda Lyons‘ trio of “Songs From the F Train” at the top of the evening with Thomas Bagwell accompanying on piano. A co-commission from AOP, Fort Greene Park Conservancy and The Walt Whitman Project, “Songs from the F Train” is a setting of poems by three Brooklyn students between the ages of 9 and 12. Since its premiere last summer at the Make Music NY festival, it has been programmed on numerous occasions throughout the city. To finish the evening, Turkish-American composer Kamran Ince was on hand to debut new music from his developing opera Judgment of Midas with authentic Turkish instruments providing the gateway into the setting of this ancient Greek myth set in the composer’s ancestral homeland. Met Opera Maestro J. David Jackson, accompanied by fellow music director Jonathan Khuner, conducted Met baritone Richard Bernstein as Apollo in his musical duel with NYCO tenor Matt Morgan‘s forest god Pan. Nicole Mitchell, Sarah Nelson Craft, Sarah Moulton, and Heather Meyer also sang the evening to a close.